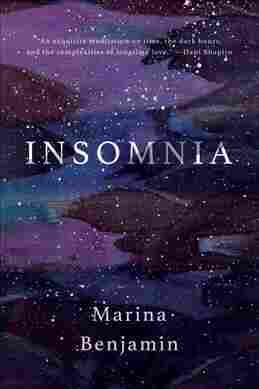 'Insomnia' Is Both A Celebration And Lament Of Sleeplessness Marina Benjamin's book is more impressionistic and personal than scientific: Don't look here for an explanation of the chemistry or biology of nocturnal wakefulness. This would be a terrible thing to say about most books but, in this case, it might actually be a compliment: I kept falling asleep reading Marina Benjamin's Insomnia. I wasn't so much bored as somehow soothed by her velvety ruminations on night wakefulness, which run on, unbroken by chapters, with lots of airy white space between paragraphs. Awash in the comfort of a kindred soul, I relaxed enough to be lulled into sleep. Did her Insomnia cure mine? Think how many hours are lost to night frets, which Benjamin ties to a "turbocharged ... overactive brain" and I liken to a washing machine's spin cycle. I know that my insomnia has increased since the 2016 election, and I don't think I'm alone. Benjamin's Insomnia follows Middlepause, her memoir about reaching 50, and indeed, insomnia often follows menopause, almost as reliably as Winter follows Fall. Her eloquent description of the inconsolability and frustration of finding oneself irremediably awake during the witching hours, "cannibalized by your own gnawing thoughts," will certainly strike a familiar chord for many. She nails the "shotgun awakenings," the sense of being "jet-lagged in your native time zone," and the exasperation of being stuck chewing over all the day's insignificant "crud," "like waterboarding the mind with meaningless overflow, a smothering drip, drip, drip of surplus thought." Even worse are the nocturnal worries: "In my bed, I flap and thrash like a grouper caught in the net, victim to an escalating anxiety," she writes. "It is as if all the lights in my head had been lit at once, the whole engine coming to life, messages flying, dendrites flowering, synapses whipping snaps of electricity across my brain; and the brain itself, like some phosphorescent free-floating jellyfish of the deep, is luminescent, awake, alive." She adds that, unable to find the off-button, "I pursue sleep so hard I become invigorated by the chase." Benjamin's book is more impressionistic than scientific: Don't look here for an explanation of the chemistry or biology of nocturnal wakefulness. She pooh-poohs pharmaceutical sleep aids, and is also dismissive of a five-week course of cognitive behavioral therapy for insomniacs, which adds to her torment with its strictures about sleep hygiene and distressing, restrictive sleep diets. Meanwhile, her husband, whom she amusingly dubs "Zzz," slumbers peacefully beside her, heightening her sense of isolation. Benjamin's mind works like a wide-roving trawler that rakes an area repeatedly before moving on to adjacent territory. Among the live fish caught in her net: Greek mythology; Penelope weaving and unraveling Laertes's shroud as she awaits Odysseus' return; Sheherazade spinning nocturnal yarns to save her life; Nabokov's dream diary; poet Charles Simic's "The Congress of the Insomniacs"; Oliver Sacks's Awakenings; Rene Magritte's surreal paintings that combine day and night; and the Pre-Raphaelites Edward Burne-Jones's and William Morris's depictions of sleeping maidens. Her thoughts on some of these subjects are hit and miss — and sometimes soporific. But concerning Freud's focus on the interplay between conscious and unconscious minds she writes amusingly, "It cheers me to note that because psychoanalysis works to excavate the brain's nocturnal effusions and then drag them into the light, it is essentially an insomniac practice." And her reflections on Robinson Crusoe lead to an unexpected discussion of slave labor and the dark side of capitalism and colonialism, in which she points out that what was being grown and imported were addictive stimulants: tobacco, coffee, sugar — "generators of mass insomnia." Insomnia turns out to be somewhat of a celebration of sleeplessness as well as a lament. It is strongest at its most personal, and is filled with memorable images — including a Cree dream catcher that "resembled a giant dangly earring," and Benjamin's nocturnal canine companion's "legs splayed like bagpipes" on the sofa beside her. Especially vivid is the "trail of evidence" she leaves behind on insomniac nights, which resembles "the scene of a crime. All that is lacking is the body shape outlined on the floor: the missing body, wakeful when it should be sleeping." Benjamin's book is more likely to elucidate than cure your insomnia, but it does offer a distracting brain-teaser for your next bout of sleeplessness: Try to come up with a collective noun for insomniacs. She toys with a flare, a fret, a brightness, before hitting on "a calculation of insomniacs." I'm partial to a jitter.